My friends, my ex-fiance and I became addicted to Medieval Madness very quickly. 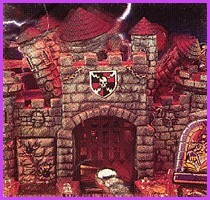 They enjoyed the open playfield and the ability to destroy castles or battle evil trolls. I enjoyed the deep rules, humor and challenge of getting a chance to battle for the kingdom. This wide range of appeal is what the designers were looking for and I would have to say that it worked. The only place I saw MM locally was at Sportland (a recreation area with a decent arcade). It was in "new" condition and played perfect. We would drive to Sportland just to exclusively play MM. Then again, this was not unheard of for a game we really enjoyed. It eventually left, as they all do. I also located MM at Cedar Point. Ironically, the castle would never register a full blow on the inside. You only could knock down the drawbridge and open the gate. You could shoot inside the castle until your hands turned blue. It would never register. You could never destroy a castle. Sigh!